In the July 2018 issue, Reactor 1 (R1) in Stockholm was featured on the cover, to illustrate the concept of sustainable decommissioning. This time, Kristina Gillin takes a closer look at the innovative activities – past and present – inside the R1 reactor hall. FOR NEARLY 65 YEARS, MOST passers-by at the Royal Institute of Technology (KTH) in Stockholm, Sweden have been unaware of the work of creative minds in a rock cavern below. But behind an inconspicuous entrance, just steps from the city’s bustling East Station, an elevator brings you 25m down into the bedrock where a unique site – and sight – awaits. 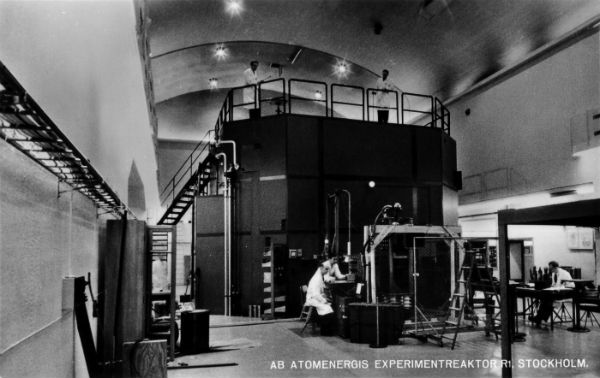 While there are obvious differences between now and when the reactor was in operation, the overarching objectives are strikingly similar: experimentation, collaboration, learning and sharing. By looking back at how R1 has evolved, Sweden’s first reactor site also shows the potential for reuse after shutdown. All it takes is a creative mind, and seeing assets not liabilities. After World War II, Sweden was among the countries that had nuclear ambitions. In 1950, a group was formed to develop the country’s first reactor. The purpose was to study and learn more about the basics – reactor physics, radiation, materials, etc – but also to produce medical isotopes. Among his tasks, Karl-Erik Jonsson calibrated the monitoring instruments. This was done in a separate building at ground level, to ensure that there was no interference from the reactor. He says: “While the instruments may have been bulky, they were very precise. For some calibrations we used instruments from Professor Sievert.” Professor Rolf M. Sievert was, at the time, head of the radiation physics department at Karolinska Institutet and it was he who gave approval to operate R1. He was a pioneer in dose measurements and the medical applications of radiation, and gave his name to the SI unit for health effects of ionising radiation. By 1970, Studsvik had become the country’s main nuclear research site and the time had come to shut down R1. While some attempts were made to preserve the reactor for its historical value, it was later demolished and the site released from regulatory control. Once decommissioning was complete, no further use was envisioned for the R1 reactor hall and adjacent rooms. The “cathedral” became dark and silent, the only exception being the occasional visit by students who were rumoured to have found their way down after parties. After more than a decade of being mothballed, a few faculty members had an idea: reuse the hall as an experimental performance space where scientists and artists can collaborate. In 1998 “The Cave Experience” – an interactive multimedia installation – saw the light. This was the beginning of what has become a creative meeting space for a wide range of activities. When exiting the elevator and entering the reactor hall it is easy to see why. A clearly industrial scene – with railings, pipes, overhead crane, offices and control room equipment still in place – with that sky-like ceiling. Old mechanical designs, mixed with the latest multimedia technology. Everywhere, the spray-painted grid used to confirm that the site was below release limits. And in the middle, a gaping hole where the reactor used to be. In one art installation, the bottom of the hole was the starting point of a 3km long laser sculpture. The beam was directed up through a vertical shaft and over to KTH’s clock tower (the highest point on campus). From there it was sent across town to Stockholm City Hall. “Stockholm by light” symbolised the span of everything created at KTH and passed on to society. Research is also a cornerstone of the revived activities at R1, including visually connecting remote places to enable high-quality long-distance communication. In one experiment, visitors at the National Museum of Science and Technology were connected with a tour guide inside the R1 reactor hall through real-time video and audio. As in any museum, the visitors were shown around and given the opportunity to ask questions, which demonstrated the potential of mediated meetings in making cultural heritage sites more accessible. With its remarkable acoustics and visual backdrop, R1 attracts performing artists; for live theatre and concerts and as a studio for music and film productions. This includes being the set of music videos such as Madonna’s “Nothing really matters” and Alan Walker’s “Faded (Restrung).” Enhancing the musical capabilities further, the reactor hall today houses a renovated Wurlitzer pipe organ from 1926 (originally used at a movie theatre) – the sounds of which cannot be described in words. “If they had known what R1 would become, more could have been kept and reused,“ says Leif Handberg. Even so, it is clear that the site of Sweden’s only fully decommissioned reactor has found a new productive use and continues to both aspire and inspire.